I'm a bit ambivalent about this one. I've read and loved all of Rainbow's books. Fangirl is by far my favorite of her books. However, I thought all the Simon Snow stuff was rather silly. I'm interested to see if this book will change my mind. Carry On is a ghost story, a love story, a mystery and a melodrama. It has just as much kissing and talking as you’d expect from a Rainbow Rowell story — but far, far more monsters! OMG I can't wait for this! I just adored Fangirl! I loved Fangirl too! Though I actually really enjoyed the Simon Snow extracts, so I'm very excited about this book. Not my favourite cover of Rainbow's, but I'll live with it. Great pick! 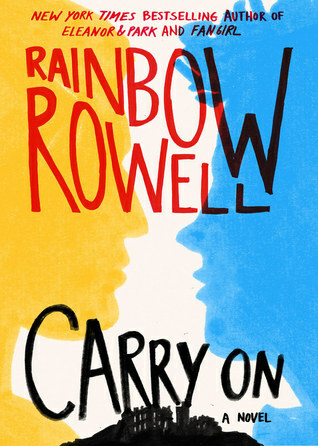 I haven't read a Rainbow Rowell book yet and I'm all kinds of curious! They sound like fun! I'm not sure about this one either...I loved Fangirl, and the author's two adult books, but I can't imagine the Simon Snow stuff carrying the story. Maybe I would be surprised, though. Thanks for sharing. Rainbow is fantastic! So excited for Carry On! Great choice! I am so excited about this book. I love fantasy. I love Rainbow Rowell. I love Fangirl. I cannot wait to read me some Simon Snow. I wasn't sure of the Snow parts of Fangirl when I started, but the characters grew on me and I wanted to know more. This should be a fun read. Seeing a lot of this one today! Contemps aren't really my read anymore, though this one does seem to have more paranormal to it. I just worry I won't enjoy it since it's a "sequel" of sorts to the first which was a contemp, and I never read it, so I feel like I might be lost in the going on of things.